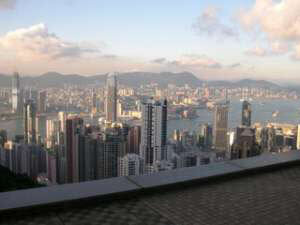 Today Hong Kong is internationally known as a strong financial and corporate center. It has the world's 7th highest GDP per capita. Foreign investment has a huge role to play here still. There are over 4,000 foreign companies which have their base here. Hong Kong practices free trade, has easy regulations, and taxes are low. The economy is mainly service based, with banking (15th largest), finance (world's 6th largest foreign exchange centre) and corporate as the major emphasis. The property market, tourism and trade (11th largest trading economy) are other key drivers economically. Very little has changed after the China takeover of 1997. Hong Kong is run with the principle of 'one country, two systems'. It has a huge degree of autonomy except for foreign affairs and defense, where the Chinese government exercises full control. Hong Kong operates with its own dialing code, currency, police, controls etc. The Government of Hong Kong as the Special Administrative region of the People's Republic of China is small yet very efficient. There is a Chief Executive elected by an 800 member selection committee comprising of professionals and businessmen. He is answerable to the State Council of the People's Republic of China. There is a 15 member Executive Council to assist the Chief Executive. There is a 60 member Legislative Council. Between the British rule and now there are only a few visible changes like the Chief Executive instead of a British Governor; the British flags have gone except from the High Commission, the Queen's portrait has gone from the currency. However, English is still taught in schools, though Cantonese has been introduced in many. Hong Kong remains an independent member of APEC, IOC etc, aviation treaties are independently organized; Hong Kong residents have easier visa access all over the world. There is more Freedom of Press and people. Cars, unlike in China, are driven on the left. Electrical plugs BS 1363 and PAL 1 TV transmissions are used like in Britain. The standard electrical voltage in HK is 220 volts AC, 50HZ. Some statues and road names from the British historical past still remain.